During the momentous year, the Japan Foundation New Delhi held various events themed on "People-to-People Exchanges." 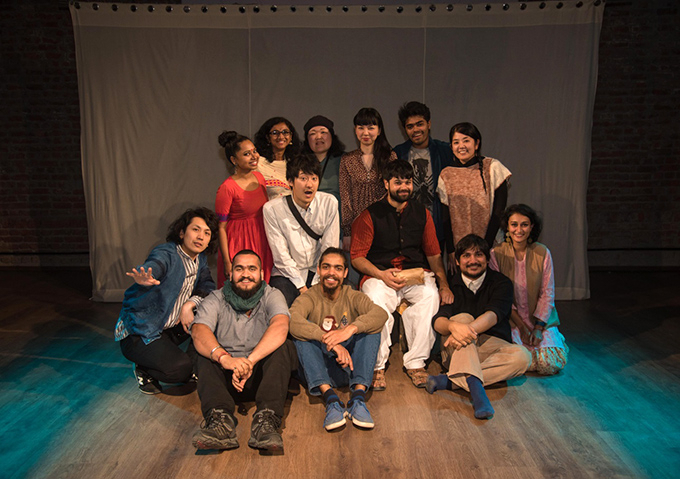 Placing value on the network of Japanese performance groups and artists who have a connection with India, we develop sustainable and expansive projects for the purpose of deepening understanding of Japanese culture in India and strengthening the ties between Japan and India. I would like to introduce these collaborative productions. 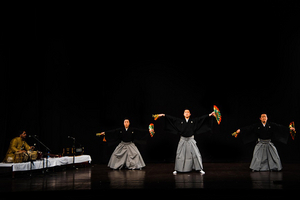 The first is a performance, This Will Only Take Several Minutes, staged by a Japanese theatre group, Hanchu-Yuei, and an Indian group, The Tadpole Repertory. 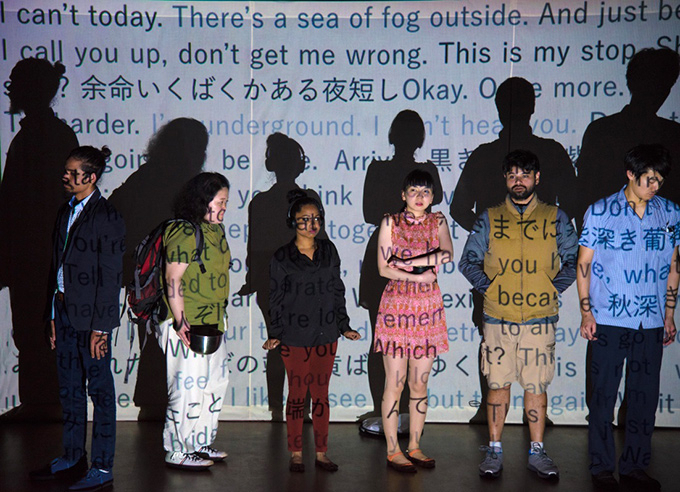 Neel Chaudhuri and Suguru Yamamoto, the stage directors from India and Japan, communicated for three years after their first encounter in 2014. Their collaboration culminated in December 2016 when the members of Hanchu-Yuei stayed for 55 days in the cold and foggy city of Delhi to put on this drama. In February 2017, they staged their performance in four major cities of India (Delhi, Mumbai, Pune and Bengaluru), and met with a favorable reception. In July of the same year, they also gave a public performance in Tokyo, Japan. Actors (from the left): Piyush Kumar, Mikie Tanaka, Shaik Sheeba, Ayana Shiibashi, Bikram Ghosh and Kan Fukuhara. Although at first they encountered a few stumbling stones arising from the language barrier and difference in customs, they made it to the finish line. All those concerned including the actors and the creative staff alike stood on an equal footing, making sure that they knew what others had in mind at every phase. Instead of basing the story on something that was already written, they gathered the threads of ideas and improvisations shared by members including the actors to build up the characters. It was literally a work that projects our contemporary life. And that was why the audience in both countries seemed to have empathy for the characters. International collaborations are not uncommon these days, but this project was unique in the sense that it was produced by two scriptwriters/directors of two different theatrical groups which shared long hours together solving problems and establishing a strong relationship as if they belonged to a new group of performers. 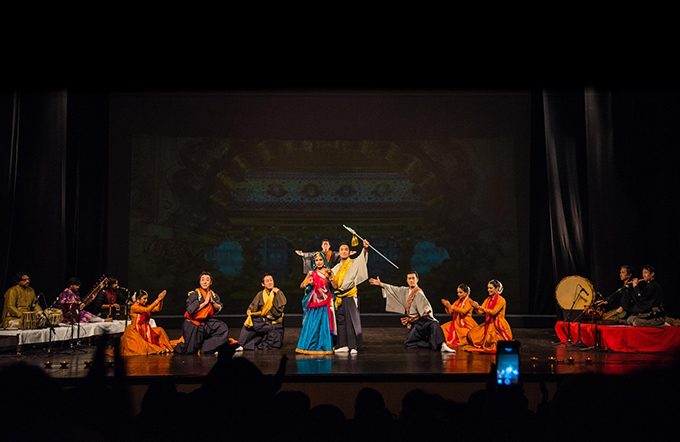 The Year of Japan-India Friendly Exchanges closed with a stage performance by Goyokai from Japan in collaboration with Japanese and Indian classical musicians and Indian dancers. Goyokai is a group of five up-and-coming Japanese traditional dancers from different schools who are at the forefront of Nihon Buyo traditional Japanese dance circles today; Minosuke Nishikawa, Juraku Hanayagi, Motoi Hanayagi, Rankoh Fujima and Tomogoro Yamamura. The Hogaku traditional Japanese musicians were Shinjuro Katada and Haruhisa Hosei. The Indian group consisted of musicians, namely Fateh Ali Khan (sitar) and Amaan Ali Khan (tabla), and dancers of Indian classical dance, kathak, led by Sangita Chatterjee. 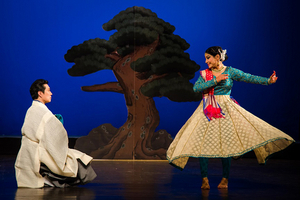 The idea of a joint performance developed from visit by Goyokai to India in 2016. They kept in touch until they met again in India in December 2017 to create and present their collaborative work. Both traditional performing arts have their own history and heritage. We were concerned that the strong characters might clash and conflict with each other. The first piece was Sambaso in which the dancers performed to the rhythm of the tabla; the second was Hagoromo with the kathak dancer performing the role of a heavenly maiden; and the third was Ramayana performed by all the members. Accompanied by an ensemble of musical instruments from the two countries, which fundamentally employ different rhythms and scales, it was amazing to see the epic poem of ancient India beautifully narrated by traditional dancers of both Japan and India. The Delhi performance drew a full house. At the end of the program, the audience gave a standing ovation to the artists of Japan and India performing together with deep mutual respect and understanding. In celebration of the successful performances in India, a joint work titled "A Midsummer Night's Encounter with the Spirit of India and the Heart of Japan" will be staged on Tuesday, July 3, 2018 at the Small Theatre of the National Theatre in Tokyo hosted by the Nihon Buyo Foundation. We cordially invite you to attend this special event. *The performance run has already ended. Misako Futsuki joined the Japan Foundation in 2009. 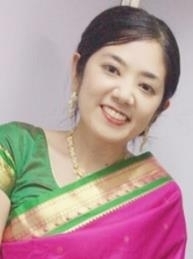 After working in the Arts and Culture Department and Budget and Finance Division, she was assigned to the Japan Foundation, New Delhi to be in charge of Arts & Cultural Exchange in December 2013. She works with a strong desire to contribute to Japan-India cultural exchange through film screenings, exhibitions and workshops and presenting theatrical art.